Now this will be the hard part! 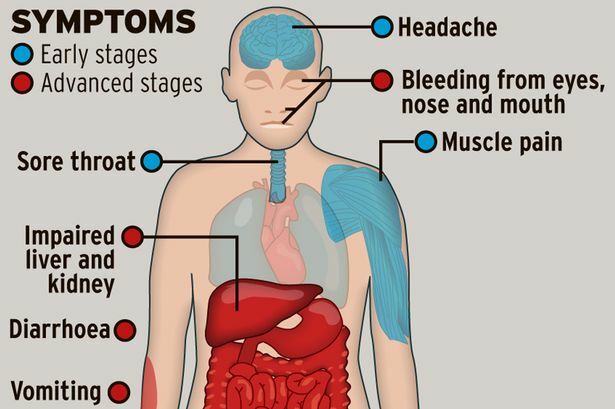 Ebola has a lot of common symptoms which can be confused with flu symptoms as well as the common cold virus. It is now the end of October and we are heading into the cold and flu season. Ebola symptoms are very similar to the Flu like symptoms, but Ebola mounts a Rapid; full scale attack virtually in every system of the body. Ebola doesn’t spread through the air like the flu; it is direct contact through bodily fluids. Many Flu victims can at least get out of bed from one to three days. If you are infected with Ebola it hits you fast and you can get very ill. These are some shared symptoms between each virus: After five days of both Ebola and the Flu you will have a sore throat, coughs and fatigue. During eight days of each illness you will have high fevers, sore throat, headaches and fatigue. You have to take these symptoms seriously, just a little cough can be serious. Having either virus is not OK! Main concern is that we all are aware that flu season is kicking into gear! but the Physicians are afraid that a lot of people will get the Flu symptoms confused with the symptoms of Ebola. If you have any of these symptoms Go take care of it Now. Waiting is not an option! ← What age should you get married ?